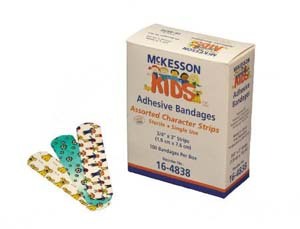 McKesson KIDS Adhesive Bandages with assorted character strips. 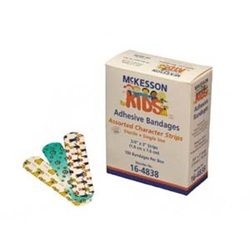 Helps protect cuts and scrapes by conforming to skin with an absorbent, non-stick pad. Sterile, single use bandages measure .75" x 3". Made from breathable plastic that is latex free. Comes 100 per box.